Tuition set earlier this year for the 2017-2018 school year will increase for all students by 3.9 percent due mostly to an increased need for student financial aid, according to President Paul Hennigan. In his role as university president, Hennigan proposes the increase on a yearly basis in the form of a budget to the board of trustees, who approves tuition rates. The finance group working under the president’s office puts together the budget based on a number of factors, primarily enrollment. 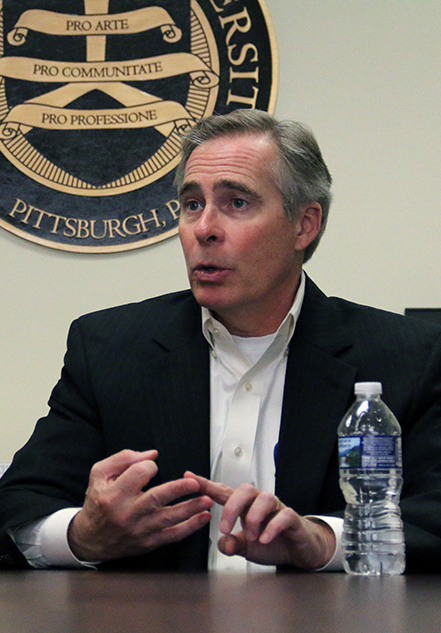 Hennigan defines Point Park’s “sector of the market” as small, private colleges and universities in the greater Pittsburgh area. He likened the university’s budget to a larger-scale version of a home budget where tuition is the primary source of income whereas financial aid and personnel are the primary expenditures. Hennigan then listed other contributing factors to the gap between expenditures and revenues. “We have personnel costs, health care costs that go up every single year, utility costs that go up every single year, so we try to estimate all of those costs and after we have estimated what we think our enrollment revenue numbers are and what we think our expenditure numbers are, we compare the two,” Hennigan said. The difference, after cutting expenditures where possible, is then passed on to students in the form of tuition increases. Tuition for the 2015-2016 school year was a 4.9 percent increase for students in the Conservatory of Performing Arts and a 3.9 percent increase for non-Conservatory students. Tuition for the 2016-2017 school year was a 2.9 percent increase from the preceding year – the lowest increase in recent years. The numbers are calculated based on the difference between those enrollment estimates and the existing need for financial aid. If both tuition and the need for financial aid increase annually, how can an institution expect to balance a budget in this way? Financial aid given by the university is broken down into two categories: merit and need-based scholarships. “For most students, it’s balancing out because what one student might get in a presidential scholarship, another student is probably going to get in a need scholarship and all of that information by law is confidential, so I can’t go into details about how scholarshipping works for individual students,” Hennigan said. Point Park offers three scholarships for students in the Conservatory of Performing Arts: the Artistic Achievement (ranging from $3,000-$25,000 annually), Dean’s Academic Freshmen ($5,000) and Dean’s Academic Transfer ($5,000). These awards are based upon GPA, SAT and ACT scores and must demonstrate a “high caliber of artistic ability” within their artistic audition process or interview. “Surprisingly, it all kind of balances out in the end because your circumstances are going to be different than his circumstances, and your merit scholarships might be different but your need usually balances it out,” Hennigan said. Calling financial aid the “biggest expenditure driver,” Hennigan explained the economy has an impact on students’ need. Hennigan said the university has explored offering a “locked in” tuition rate where a student would pay one flat tuition rate for their four years at Point Park. He said that in order to do so, the percent increase for that initial year would be too high to justify it, guessing that it would increase somewhere between 16 and 18 percent. Lou Corsaro, managing director of university marketing and public relations, said in the same Mar. 22 interview that expenditures for the university do not include larger capital projects such as the new Pittsburgh Playhouse and Center for Media Innovation (CMI). Hennigan said that there are no plans for larger capital projects and the existing projects do not impact the price of tuition. Hennigan said that while the national average of an undergraduate student loan in the U.S. is $24,000, and the average undergraduate loan at Point Park is $16,000. It should be noted that without access to individuals’ accounts, this figure cannot be confirmed.